In Marathes, a small family business, made with love and care, we are expecting you for an unforgettable holiday. Marathes is 12 km from the town of Lefkada. 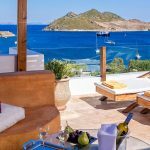 Its location is between two wonderful beaches, 500 meters from the famous beach of Agios Nikitas and 1 km from the beautiful beach of Kathisma. Surrounded by olive trees, in a peaceful environment, offers a view of the sea as well as to the mountain. There are bus itineraries to Kathisma and Agios Nikitas. Marathes is composed of fully-equipped studios, capable of providing accommodation for 2-5 persons. The studios have a kitchen, bathroom, air-conditioning, and TV. They are cleaned every three days, by changing the sheets, the towels and with general cleaning. On the ground floor, there is our own tavern, offering traditional dishes. It is a family business, with home-made food. In Marathestavern, you will find fine quality, low prices, home comfort smile, and full service from people who love what they do. With the result being accomplished with love, attention, and care.